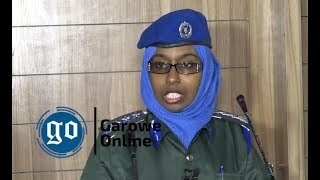 GAROWE, Somalia, April 20, 2015 (Garowe Online)- At least six people were killed after suicide bomber blew hiself up, signalling rare brazen attack on high-profile target in the state capital of Garowe on Monday, Garowe Online reports. 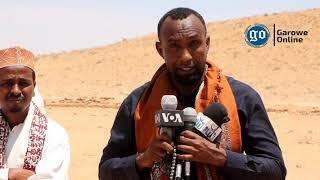 Of the six UN staff members on board, four were foreign nationals according to Nugal regional police commander Col. Ahmed Abdullahi Samatar. "Seven people including the suicide bomber died in the attack. Seven UN staff members sustained injuries;two foreigners and five Somali nationals," Col. Samatar told reporters, adding that police are holding the charred remains of the suicide bomber. Details released afterwards declared the four foreign nationals: Brenda Kyeyune, Ugandan, Payenta Gul, Afghan, and two Kenyans identified as Woki Munyui and stephen Adero. Sources close to the UN told Garowe Online that the suicide bomber whose severed body parts littered the bus approached robustly. Witnesses said the suicide bomber smashed the bus while driving in front of entrance to United Nations main compound in the capital. 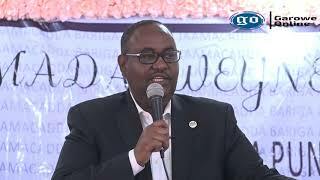 .Puntland Vice President Abdhakin Abdullahi Haji Omar Amey called the attack 'brutal act and futile', aimed at undermining regional stability: "We strongly condemn this brutal and inhumane attack, and we assure that such rampages would not affect pervailing peace and stability of Puntland," said Amey. 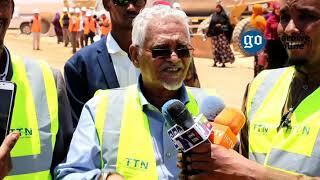 Military operations spokesman Abdiasis Abu Muscab told Al Jazeera that they targeted UN staffers in Garowe. 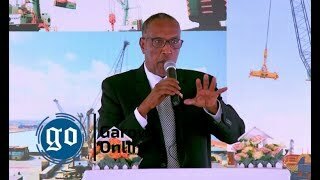 Somali militant group on Saturday claimed responsiblity for raid on police compound in the Gulf of Aden port city of Bossaso. Puntland Defence forces are battling Al Shabaab fighters in the rugged terrain of Galgala and hideouts along Golis Mountain Ranges.